This is a comprehensive horse training agreement that includes provision for boarding and the option of rider training. Although drawn for professional trainers who are likely to offer remedial training, lessons to the owner and competition experience, it could also be used by someone breaking a friend's horse as a one-off favour. Using this agreement should help prevent disputes arising as a result of mismatched or unreasonable expectations as to the service offered. Many horsemen simply agree to a training deal casually under the proposition that the owner will turn up from time to time for lessons on her ever-improving horse. It is easily done. But that leaves you open to numerous potential problems. Without the terms of training written down, it is likely that at some point you will disagree with your client about exactly what level of service you are providing and what they should reasonably expect from you. This agreement is your route to happier clients, an easier life and less worry about what might go wrong. By confirming the condition of the horse and whether it has any vices or problems, you will protect yourself from claims that the condition of the horse has deteriorated in your care. Failure to bring on a horse as quickly as the owner expects is also a common point of dispute. The agreement sets out the obligations of the horse owner too. Information she provides must be true and full. And if she just forgets to tell you that her horse will destroy your lorry, you have a neat provision that she will be paying the repair bill. The agreement also covers many aspects of what is included in your deal. If both sides know exactly what each other’s expectations and requirements are from the outset, the arrangement will be a success. Disclaimers also include cover for situation when you are asked to ride a client’s horse on your land or anywhere else. This document has been designed to be used by a professional horseman-trainer working with clients’ horses at his own stable or establishment. However, the agreement is also suitable if you are taking a friend's horse as a one-off favour for a few months. Terms that seem excessive for your needs can be removed and guidance as to what you should leave is provided with the agreement. This document protects the interests of the trainer first, but is fair to clients. The use of plain English throughout will remove any worry from your clients that they need are signing a document that they need a solicitor to check before signing. The law in this agreement is common law, so you can make the deal that suits both parties best. 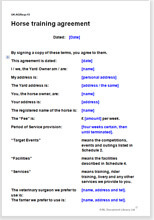 Either you can edit the agreement to be your terms and conditions (and use the same version for all customers) or you could edit this contract for each horse or pony you take. Of course we take it for granted that you are aware of equine welfare issues, but they do not impact directly on your contract with the owners. Additionally, there are 3 schedules to the agreement that contain details about the horse and the service you will provide.